The Constitution is one of the most revered documents in American politics. Yet this is a document that regularly places in the White House candidates who did not in fact get a majority of the popular vote. It gives Wyoming the same number of votes as California, which has seventy times the population of the Cowboy State. And it offers the President the power to overrule both houses of Congress on legislation he disagrees with on political grounds. Is this a recipe for a republic that reflects the needs and wants of today's Americans? In Our Undemocratic Constitution: Where the Constitution Goes Wrong (And How We the People Can Correct It), Sanford Levinson argues that too many of its provisions promote either unjust or ineffective government. Under the existing blueprint, we can neither rid ourselves of incompetent presidents nor assure continuity of government following catastrophic attacks. Also problematic is the appointment of Supreme Court judges for life. Adding insult to injury, the United States Constitution is the most difficult to amend or update of any constitution currently existing in the world today. Our Undemocratic Constitution boldly challenges the American people to undertake a long overdue public discussion on how they might best reform this most hallowed document and construct a constitution adequate to our democratic values. Sanford Levinson holds the W. St. John Garwood and W. St. John Garwood Centennial Chair in Law at The University of Texas Law School. The author of over 200 articles in professional and more popular journals, his books include Constitutional Faith (1988); Written in Stone (1998); Wrestling With Diversity (2003) and the edited volume, Torture: A Collection (Oxford University Press, 2004). Professor Levinson will be a visiting professor of law at both the Harvard and Yale law schools during the fall of 2006. 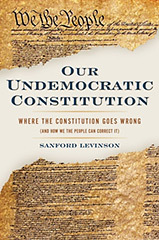 "Sanford Levinson is the most imaginative, innovative and provocative constitutional scholar of our time. His new sharp critique of the Constitution makes for bracing reading and forces us to confront what we really think of the Constitution. Every American needs to read this book and see if he or she agrees with Levinson that it is necessary to abandon the Framer's work and adopt a fundamentally new system of government. This work cannot be ignored." The Texas Book Festival on Saturday, Oct. 28 at 2 p.m. in the Texas Capitol Extension, room E2.016. For more information: www.texasbookfestival.org. Available from Oxford University Press, Amazon.com, and BN.com, and local book stores.